If you are a fan of Gatorade and an Amazon Prime member, you’ve found the right spot! Amazon has launched a new Gatorade Sample Box. You pay $8 with free standard shipping (you can’t check the shipping speed on Amazon Samples), and for that you receive a box of Gatorade nutrition samples. The page above shows five different items, including protein bars, chews and powders. You may receive a slightly different selection depending on what’s available at the warehouse. Then, after this order ships, you will receive an email from Amazon informing you that a $8 credit has been automatically applied to your Amazon account (no coupon code is needed). You can spend this credit on 90+ eligible Gatorade nutrition products. These are mostly solids, not liquid Gatorade bottle. The spending happens automatically in the shopping cart as long as you have eligible products in there. So assuming you can spend the $8 sample credit on products you like or want or need, then you’ll getting the samples for free in a roundabout way. I’ve done multiple samples boxes and individual samples, they work like clockwork. It’s a pretty good way to try new items and stock up on your favorites. On rare occasion a product may qualify for multiple categories, so it may pull multiple sample credits (which means you pay even less out of pocket). Everything’s possible at Amazon! Even clip-on coupons on their Sample boxes! That’s right, the sample boxes. Currently Amazon has two men’s grooming boxes and each one of them has a 15% off green clip-on coupon on them! 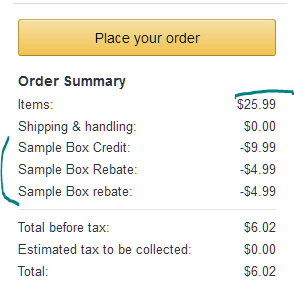 So the $17 Sample Box becomes $14.45 after you clip the green coupon, while the $20 Sample Box drops to $17. You get free shipping regardless. I believe these ship separately, and they have only one shipping option (standard shipping), so you cannot make any adjustments or get the $1 digital credit on them. As before, these offers are restricted to Prime members only. The promotion works just like the other sample boxes. Your Prime membership is hard at work with a brand new K-Cups Sample Box! 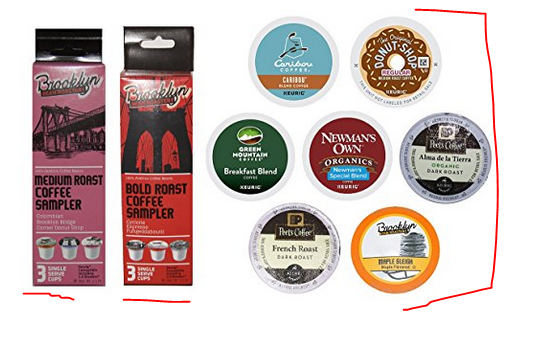 You pay $8 and you get a box of various K-Cups from Peet’s, Brooklyn, Green Mountain, and more. You will receive a minimum of seven K-Cups in your sample box. 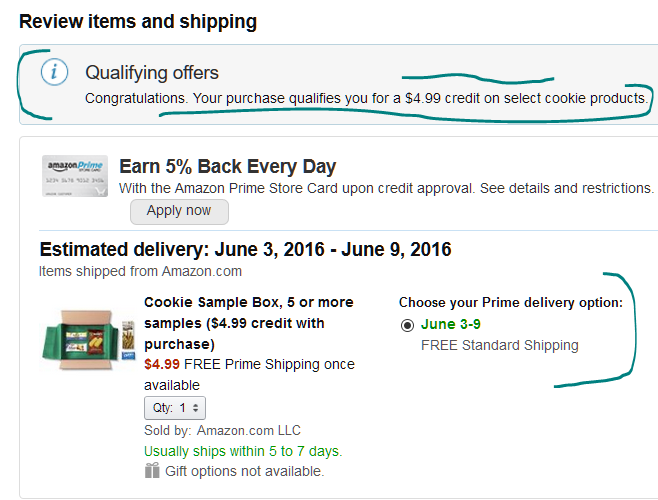 After you receive your Sample Box, a credit of $8 will be automatically added to your Amazon account. 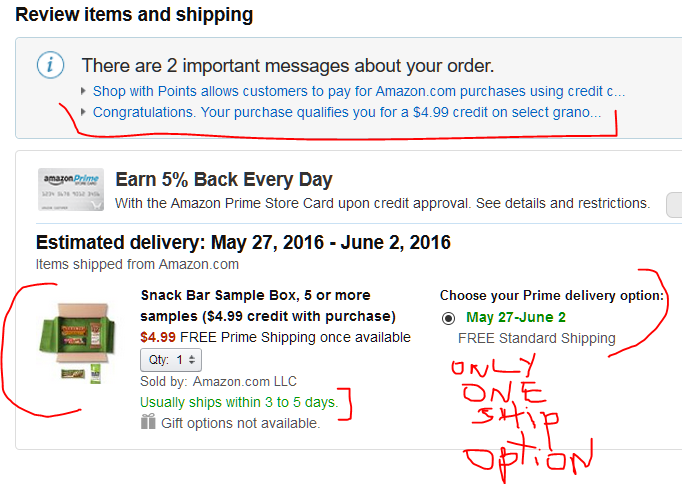 Amazon will notify you by email that the credit is in your account. Then you can use that $8 credit to make a purchase from these 100+ eligible K-Cups from a various companies. While the Sample Box is all coffee, the redemption of your $8 credit has more flexibility. In addition to coffee, there’s also various teas and hot cocoa and such. PS: as with previous offers, this is restricted to PRIME members only. Rejoice Sample Box addicts. 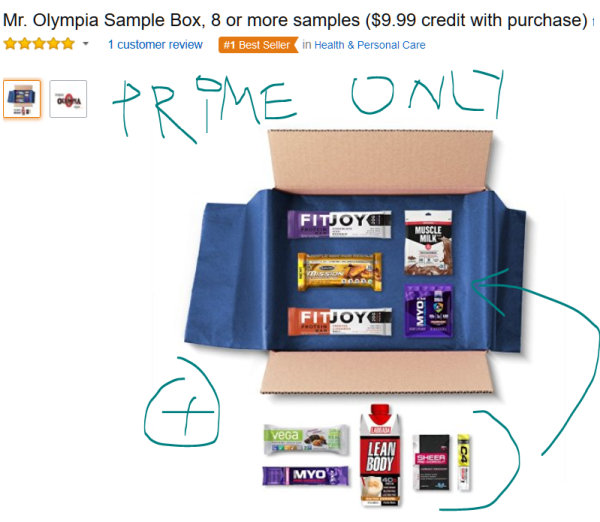 For Prime members only, Amazon has launched a brand new one, it is a Mr Olympia Sample Box for $10. For that, you get at least eight samples in the fitness and body building category (as the “Mr Olympia” name suggests). About a week after your order ships (not after you place it), you will receive a $10 ($9.99 to be exact) credit to your Amazon account. They will send an email informing you of this. The sample boxes have only one shipping option, and they are not eligible for 2-day Prime shipping or slow-shipping credits. Once the credit is in your account, you can use it to purchase any combination of all these Fitness-releated products from brands including Vega, EAS, FitJoy, and Cytosport. If you want to be a totally super-thrifty shopper, look for items just over $10, such this Creatine powder. If you haven’t done this before, here are some of the Terms and Conditions. If you like to get more or see the status of your order, check the Sample Boxes main page. Hooray dog lovers or if you want to donate dog food to a local shelter or volunteers who take care or foster dogs! 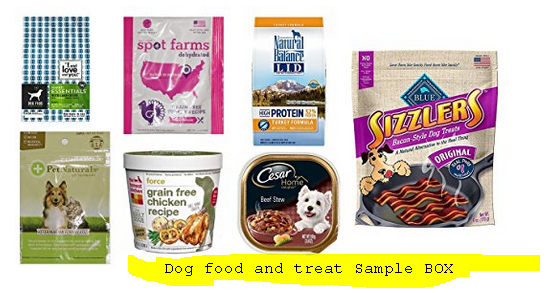 If you are an Amazon Prime member, Amazon has now launched a Dog Food Sample Box. The deal is the same as before. You pay $10 for the sample box. It arrives with a minimum of seven different foods and treats. One week after the order ships, Amazon will send you an email that a $10 credit has been added to your Amazon account. After that happens, you can use the $10 credit to purchase any combination of the 250+ eligible items. You can split the $10 credit among multiple items and multiple orders, or it can go towards a more expensive item. It happens automatically, it’s the first thing that gets deducted from the total before your gift cards and credit cards are billed. As usual, there is no stated expiration date on the offer, this is good until they run out of them. If you haven’t done this before, there are a few other Sample Boxes running. You can also check our write-ups on the previous offers. 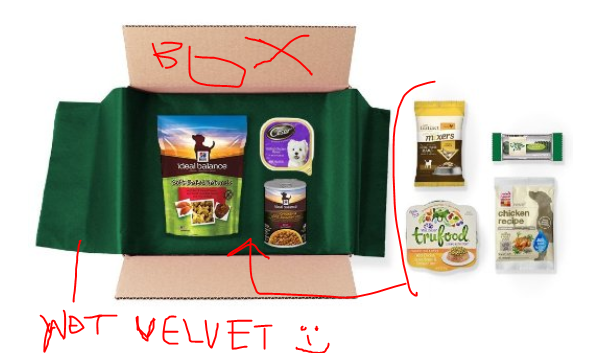 If you are fond of the Amazon Sample boxes, we have good news for you! A brand new offer got launched at Amazon. It works similarly to their previous sample boxes. You pay $4.99 out of your own pocket for Crest Sample Box and one week after this ships, you receive a $4.99 credit in your Amazon account to spend on a variety of Crest, Oral-B and Glide products including toothbrushes, toothpaste, floss, and related items. Of the previously mentioned sample boxes, the only one that continues is the Amoretti Syrup. The more versatile stuff like the protein bars and snacks are sold out. You can find out what’s available and which ones you already purchases, and also the remaining credit you have with each offer at the Sample Boxes page. PS: I will post more details if I decide to jump on the Crest box. If you participated in the Amazon Sample Box promotions and have the Credits now in your account waiting to be spent, there is a “magic bar”, magic in that it is eligible for THREE of the different credits, and the credits are stackable, so you can get it for nearly FREE! This “magic bar” is none other than the RXBAR Chocolate Sea Salt flavor. When you add it to the shopping cart, three different credits activate: the Protein Bar credit, the Snack Bar credit, and the Snack Sampler credit. When I took the screenshot above, its price was $26. As of posting time (6/6/16 PM), its price dropped to $20.80 (without Subscribe and Save), so your out of pocket is under $1. The party continues, Prime members have yet another option to buy a sample box, and then use the purchase price of the sample box towards a future purchase of similar items [see previous offers]. And now we have something sweet, something you may need to spend a few more hours on the treadmill to burn, it’s the Cookie Sample Box. You pay $5 with free shipping and you get a box with at least five samples. You have to be a Prime member to get them. There’s only one shipping option (see screenshot with drawings below), you can’t select faster or slower. I already mentioned the most versatile promotion of this lot (the Protein Bar offer). This one is not as good but the price is definitely right. So the routine is the same as before, you have to be a Prime member. 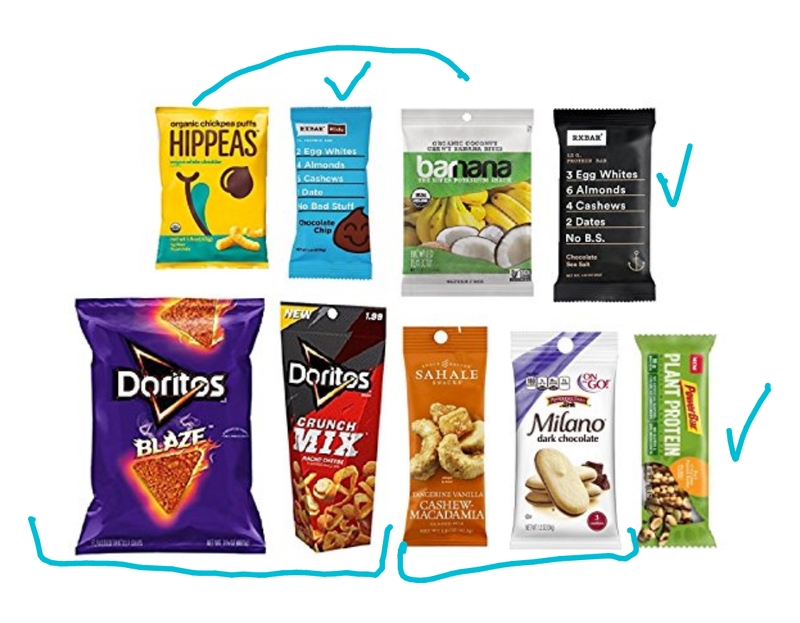 You buy this Snacks Sample Box for $5 with free shipping. You are guaranteed to get at least five snack items, but no guarantees you will receive a specific brand.